The stator on a riding mower is located on top of the engine below the flywheel. As the flywheel turns over the top of the stator, electricity is created and sent back to the battery to keep it charged sufficiently. In mowers that run a 12-volt electrical system, for example, the stator must generate more than 12 volts to keep the mower running. If you have a voltmeter and know how to use it, this job will be a snap. Testing the stator should take about 20 minutes to complete. 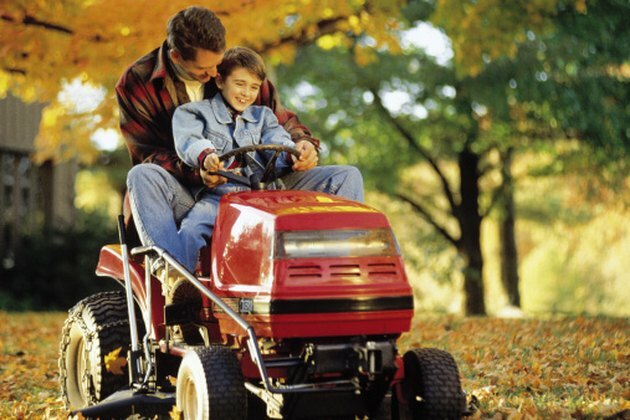 The stator on a riding lawn mower keeps the battery charged. Park the lawn mower on a level surface and set the parking brake. Turn the ignition key to the OFF position. Raise the hood of the mower to access the engine. Remove the engine shroud from the top of the engine using the 3/8-inch wrench, exposing the flywheel. Locate the stator wire under the flywheel. Disconnect the stator wire from the main wiring harness. Turn the voltmeter on and set it to AC volts. Attach the red test lead from the voltmeter to either pin in the stator connector. Attach the black lead from the voltmeter to the other pin in the stator connector. Start the engine and advance the throttle to the FAST position. Check the output, which should always be at least 30 volts. Your owner's manual will have the exact required output of your stator. If the tested output is lower than 30 volts, the stator usually needs to be replaced.